Derek Vincent Smith (born November 25, 1981), known by his stage name Pretty Lights, is an American electronic music producer. Pretty Lights was originally a music project consisting of him and Michal Menert, who left after the release of their first album. Rick Rubin once described Pretty Lights as "the face and voice of the new American electronic music scene". Smith started skateboarding with Michal Menert in the 8th grade. The pair, together with a drummer Menert knew, began making music after Smith brought a bass guitar to a skating session. Paul Brandt (Paul Basic) eventually replaced their original drummer. Calling themselves "The Freeze", the band consisted of Derek Vincent Smith on the bass guitar, Michal Menert on the guitar and keyboard, and Paul Brandt on the drums. The group was influenced by artists like the Beastie Boys, Tha Alkaholiks, A Tribe Called Quest, Wu-Tang Clan, The Roots, and The Casualties as well as by old school hip hop, funk, punk rock, and the skater culture. The band placed second in a community battle of bands in their sophomore year. After graduating from high school, Smith attended University of Colorado at Boulder, but dropped out during his freshman year to focus on his music instead. In the early 2000s, Smith performed as part of the band, Listen. Derek Vincent Smith and Michal Menert began working on Pretty Lights in summer 2004. In 2007 and 2008, Pretty Lights began playing late nights for large acts such as STS9, The Disco Biscuits, and Widespread Panic. Some of his first appearances outside of Colorado were at the end of 2008 on October 31 at Club 6 in San Francisco, CA, November 14 at The Parish Room in Austin, Texas, and a December 6-7th show in Fayetteville, Arkansas at the former venue known as The Gypsy. 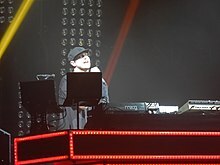 In the summer of 2009, under the moniker Pretty Lights, Smith played at several major American music festivals, such as Bonnaroo, Forecastle, Wakarusa, Rothbury, Electric Daisy Carnival, Camp Bisco, and the 10KLF. The following autumn, he went on a multi-city tour of the United States. In 2010, Pretty Lights played at the 2010 Coachella Valley Music and Arts Festival, the Ultra Music Festival in Miami, the 2010 Marchone Music Productions Illumination Show in Nashville, the 2010 Evolve Festival in Nova Scotia, Movement 2010 (the Detroit Electronic Music Festival), the 2010 Starscape Festival, Camp Bisco, Nocturnal Festival at Apache Pass, Texas, the 2010 Electric Zoo at Randall's Island in New York City, New York, the North Coast Music Festival in Chicago, Illinois, and the Outsidelands Festival in San Francisco, California. More recently, he headlined the Snow Ball in Avon, Colorado, along with Bassnectar and the Flaming Lips. In June 2011, Pretty Lights played a late-night set at Bonnaroo, where he debuted the song "I Know the Truth." Smith also debuted his state-of-the-art light show in early 2011 involving LED towers made to look like a cityscape. In July 2011, he headlined at the Electric Forest in Rothbury, Michigan, at Camp Bisco in Mariaville, New York, and at the All Good Music Festival in Masontown, West Virginia, where he performed a special "once in a lifetime" track, a remix of John Denver's "Take Me Home, Country Roads." Smith toured with drummer Cory Eberhard from August 2007 to July 2010. In late July 2010, Smith replaced Eberhard with Adam Deitch as drummer, debuting at Wanderlust on July 30. Smith stopped touring with a live drummer in 2011. On January 25, 2011, Smith released two albums on his newly formed record label, Pretty Lights Music. The record label offers free downloads of all Pretty Lights albums, plus releases from PLM artists including Michal Menert, Break Science, Gramatik, Paul Basic, Eliot Lipp, and SuperVision. Pretty Lights continues to distribute music for free, and frequently appears at festivals across the world. In 2012, Pretty Lights was featured in the musical documentary Re:GENERATION Music Project producing the track "Wayfaring Stranger," featuring Country music stars LeAnn Rimes and Ralph Stanley for a collaborative effort mixing two genres, namely electronic and country. Pretty Lights released a new full-length album titled A Color Map of the Sun on July 2, 2013. It is the first Pretty Lights album that does not rely on borrowed samples; Smith instead composed and recorded tracks with session musicians in studios in Brooklyn, New Orleans and Denver and pressed the recordings to vinyl, samples of which were then combined with modular synths and digital production methods. For his fall 2013 tour, Smith toured with a full band including drummer Adam Deitch, keyboardist Brian Coogan, keyboardist Borahm Lee, trombonist Scott Flynn and trumpeter Eric Bloom. On December 6, 2013 A Color Map of the Sun received a nomination for Best Dance/Electronica Album in the 2014 Grammys. On December 10, 2013 Pretty Lights released A Color Map of the Sun Remixes. Following the 2014 Grammy Awards, Smith relocated to Los Angeles to begin work on a new album at Rick Rubin's Shangri-La studio. After several months of writing and recording, Smith relocated to New Orleans in mid-2014. Over the following two years, Smith recorded music with local musicians and played sporadic shows with the Analog Future Band. Following Analog Future's final show at New Orleans’ Buku Music + Art Project in March 2016, Smith soon formed the new band Pretty Lights Live. The new band features Smith, drummer Alvin Ford Jr., keyboardist Brian Coogan, keyboardist Borahm Lee, and turntablist Chris Karns. On May 31, 2016, Smith announced that the band would embark on a five-stop "Episodic Festival" U.S. tour with two-day stops in Guilford, NH, Morrison, CO, Telluride, CO, Chicago, IL, and Nashville, TN. In late 2016, Smith revealed that he was working on his first new album in four years, with a tentative release date set for April 2017. Pretty Lights Live is slated to play at several major U.S. music festivals in 2017, including Summer Camp Music Festival in May and Camp Bisco in July. Smith has also put on the two night annual event known as BassLights from 2012 through 2015. Smith and crew pairs with Bassnectar to bring the yearly event to the Hampton Coliseum on the weekend between Christmas and New Years. The pair brought along with them major supporting acts such as Big Gigantic, Gramatik, GRiZ and A-Trak in 2012. 2013 featured yet again Big Gigantic along with Pretty Lights Music godfather Michal Menert, Datsik (musician) and Keys N Krates. 2013 also brought along the Analog Future Band who performed both nights alongside Pretty Lights adding a fresh new take on his music performing it with live instrumentation. 2014 kept the tradition of major opening acts going strong with the return of Beats Antique who had been a PrettyNectar Alumni from when they played in 2011 in Alpharetta, GA, Exmag, Chromeo (dj set) and Elliot Lipp. This event sold out in record time in 2014 selling out all tickets in the first weekend they went on sale. 2013 also saw an extra official Basslights that was held October 18-19 at the Klipsch Amphitheater at Bayfront Park in Miami Florida, with support by PANTyRAiD, Run the Jewels, Koan Sound and Supervision. Smith's music relies heavily on digital sampling and crosses many genres, forming a combination of "glitchy hip-hop beats, buzzing synth lines, and vintage funk and soul samples". Pretty Lights' sound is generated by manipulating samples and organic beats using the Novation X-Station, monome and the Akai MPD32. Smith uses these digital controllers to program the music production software Ableton Live 8. When performing live, Smith uses two Macbook Pros running Ableton Live 8 and two Akai MPD32s. Smith usually considers his music as "Electro Hip-Hop Soul," a mix between elements of electronic based music, and beats from hip-hop and soul music. ^ "Pretty Lights Bio, Music, News & Shows". DJZ.com. Retrieved March 11, 2013. ^ TBM. "Michal Menert [Interview]". thebeatmpls.com. Retrieved 3 January 2014. ^ Baca, Ricardo. "The Reverb Interview: Derek Vincent Smith, a.k.a. Pretty Lights". Reverb. The Denver Post. Retrieved 3 January 2014. ^ "Archive of Voicebox Records". Voicebox Records. Voicebox Records. Archived from the original on 2004-06-03. Retrieved 6 October 2014. ^ "Post-Umph Halloween in SF on JamBase". Jambase.com. 2007-02-28. Retrieved 2015-03-13. ^ Pretty Lights. "Pretty Lights in Fayetteville, AR". Eventful.com. Retrieved 2015-03-13. ^ "Pretty Lights - Finally Moving Fayetteville Arkansas". YouTube.com. 2010-08-07. Retrieved 2015-03-13. ^ Coplan, Chris. "Pretty Lights fall 2009 tour to be blindingly awesome". Consequenceofsound.net. Retrieved 8 March 2015. ^ "Derek Vincent Smith and Cory Eberhard of the Pretty Lights pose... News Photo". Gettyimages.com. Retrieved 2015-03-13. ^  Archived May 16, 2013, at the Wayback Machine. ^ "New Drummer". Facebook.com. Retrieved 2015-03-13. ^ "AOL Radio - Listen to Free Online Radio - Free Internet Radio Stations and Music Playlists". Spinner.com. Retrieved 2013-12-11. ^  Archived July 3, 2013, at the Wayback Machine. ^ "Watch: Pretty Lights produced his own vinyl records then sampled them for his new album "A Color Map of the Sun" including new track [VIDEO". this song is sick. 2013-05-19. Retrieved 2013-12-11. ^ "Need We Say More? > News > Pretty Lights Announces Full Live Band for Fall Tour". Jambands.com. 2013-10-04. Retrieved 2013-12-11. ^ "Grammy Nominees 2014: See The List - Music, Celebrity, Artist News". MTV.com. 2013-12-06. Retrieved 2013-12-11. ^ "Pretty Lights Released A Color Map of the Sun Remixes". New York Music News. 2013-11-19. Retrieved 2013-12-11. ^ "Pretty Lights: Looking Back From the Future". OffBeat Magazine. Retrieved 2017-03-17. ^ "Pretty Lights – An Episodic Festival - Pretty Lights Music". Pretty Lights Music. 2016-05-31. Retrieved 2017-03-17. ^ "Pretty Lights Announces 'An Episodic Festival' With Live Band & Special Guests". Billboard. Retrieved 2017-03-17. ^ Bruch, Thomas. "Second round of Summer Camp announcements headlined by Pretty Lights, Gramatik, Wacka Flocka". Journal Star. Retrieved 2017-03-17. ^ "Bassnectar, Pretty Lights Live, GRiZ announced for Camp Bisco 2017". EDM Chicago. 2017-02-24. Retrieved 2017-03-17. ^ a b Annika Heinle, The Stanford Daily. "Pretty Lights are pretty amazing". Archived from the original on November 18, 2010. ^ "Pretty Lights :: Flips - YouTube". YouTube. Retrieved 2017-03-17. ^ "DJ Sona's Ultimate Skin Music - Ethereal (Nosaj Thing x Pretty Lights)". YouTube.com. 2015-02-03. Retrieved 2015-03-13.